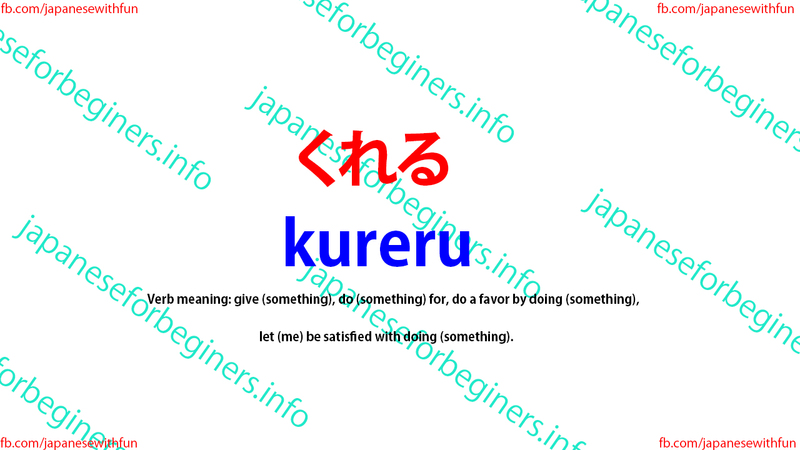 Verb meaning: give (something), do (something) for, do a favor by doing (something), let (me) be satisfied with doing (something). 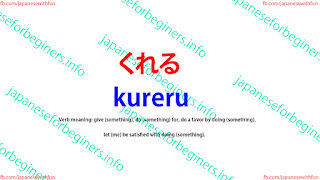 Kureru is used to express the ''giving'' of something to the speaker or to his/her family member. The first person is never the subject. Kudasaru may be substitued with persons of higher status or to whom the speaker wishes to show respect. Kanojo wa watashi no tanjoubi ni suteki-na purezento o kuremashita. She gave me a nice present for my birthday. Kare wa denwa o kuremashita ka. Did he give a call? Kanojo ga oishii ryouri o tsukutte kuremashita. She prepared a delicious dish for me. Dare ga tetsudatte kuremashita ka. Pen o kashite kuremasen ka. Would you kindly lend me your pen? Sensei ga teinei ni nihongo o oshiete kudasaimasu. The teacher teaches me Japanese respectfully.